HomeWill We Lay Down Our Lives for Jesus? Will We Lay Down Our Lives for Jesus? Romans 12:1-2, I beseech you therefore, brethren, by the mercies of God, that ye present your bodies a living sacrifice, holy, acceptable unto God, which is your reasonable service. 2 And be not conformed to this world: but be ye transformed by the renewing of your mind, that ye may prove what is that good, and acceptable, and perfect, will of God. Our Lord’s question to Peter still echoes thru the ages. 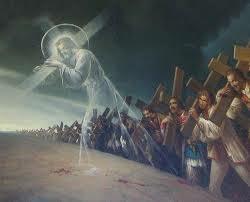 Jesus has called all who would follow him to lay down their lives, deny themselves, pick up their cross, and follow him wherever he might lead. Everyone lays down, or gives up their life, for someone or something. That isn’t even up for discussion. That’s a no brainer! We are all living for someone or something.The question is are we laying down our life for the cause of Christ and the Christ of the cause? Of course, if you know the story of Peter and his brash statement to follow Jesus, even if it meant his dying, you’ll remember that he failed drastically in his first attempt to lay down his life for Jesus. In fact, Peter, rather than courageously standing for Christ in his moment of need, Peter played the coward. Have we not all been there and done that? It wasn’t until after the resurrection of Christ and his confronting Peter about his “love life” [John 21:15-21] that Peter was made ready to eventually lay down his life for Jesus. The same holds true for you and for me. If we are going to lay down our lives on the altar of God’s purpose for our lives, as a living sacrifice, we are going to have to grow in our love for Jesus. There’s simply not other way!!! Luke 9:23-24, And he said to them all, If any man will come after me, let him deny himself, and take up his cross daily, and follow me. 24 For whosoever will save his life shall lose it: but whosoever will lose his life for my sake, the same shall save it. There’s simply no other way around it!